Love at a Distance: The Courtship, Marriage, and Love Match of John Brennan and Emma Hickman, 1864-1876. By Nancy O’Malley. (2015. Pp. 435. $25.00. Paperback. lulu.com Publishing) ISBN: 9781312743083. In a remarkably short period of time, the long distance story of a young couple unfolded between Paris Kentucky and New York City. The limited number of years, covered in a series of letters gives us a look at their courtship, marriage, family life, and death. 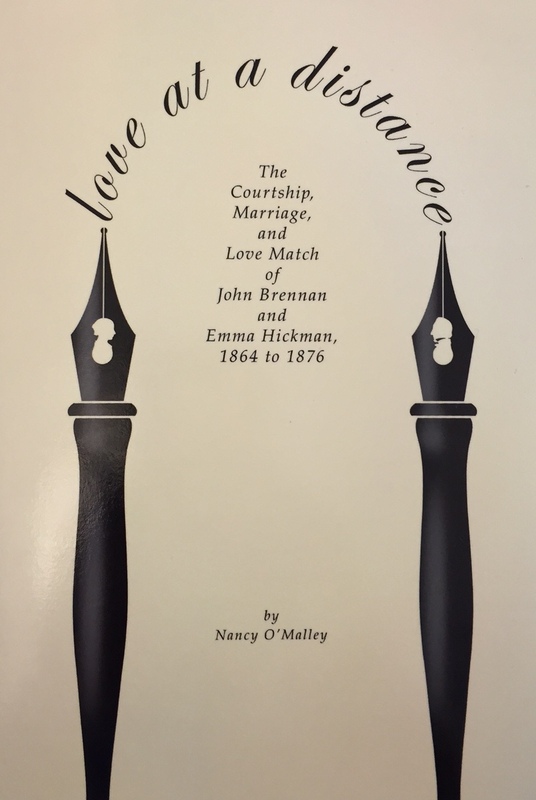 Author Nancy O’Malley was entrusted with the task of reading and processing the letters that survive between this couple, and which had been passed down by their descendants for generations. As she began her task, she realized that the many letters captured a window of time from the Civil War to the near close of the 19th century. 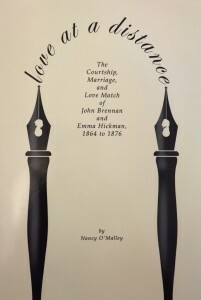 She also recognized that the couple who penned the letters were adept at putting their feelings to paper, beginning with the spark of love felt by John Brennan after dancing with Emma Hickman in Frankfort. As a Union Army Major, John Brennan was handsome and well respected, and completely in love with Emma Hickman. While he was persistent in declaring that love, Emma was resistant for a time, explaining that she had no interest in loving a soldier. Due to John’s determination, and passionate expression of his feelings, Emma eventually gave in to his charms after years of letters back and forth. Once married, the letters did not stop, as John was traveling quite frequently between their homes in Paris and New York. Despite the fact that their lives were cut short due to illness, a lifetime of love was documented through their words of constant devotion. Ms. O’Malley has gathered the letters and painstakingly transcribed them for the readers. As you follow along, encountering the eloquent prose of 19th century lovers, O’Malley weaves in details of family life and connections to help tell a more complete story. Along the way, she has sprinkled in small pieces of family artifacts from the Brennan family, which helps preserve the wider collection, and provides a few moments of visual impact. For those of you with genealogical connections to this family, O’Malley has also provided short pedigree charts for both the Brennan and Hickman families. It is rare to find such a complete collection of letters from a couple, and even more rare to find a couple as adept at putting their feelings to paper. Reminiscent of the intrigues fictionalized in Jane Austen’s works, these in-depth examples of correspondence remind us of the value placed on writing during the 19th century. The letters are presented well and flow nicely as the reader is drawn into their complex world of love and domesticity. After realizing what occurred free sample barely need to keep in mind that the that nothing will transform.